MAMMUT’S EIGER EXTREME COLLECTION HAS BEEN REDESIGNED. DOES ITS NORDWAND PRO HS LIVE UP TO ITS HUGE PRICE TAG OF £650? Designed as the ultimate waterproof hard shell for extreme alpinists, Mammut’s Nordwand Pro HS Jacket promises a lot and – with its price tag of £650 – surely it delivers? Right? The jacket has been developed over many years of collaboration with the Mammut Pro Team athlete Stephan Siegrist. It is built from Gore-Tex Pro with a little bit of stretch to allow a closer fit, with Mammut’s intention for it to be like a ‘second skin’. But, more importantly, in my view, is that attention has also been paid to the cut, to ensure that it allows freedom of movement when mountaineering. According to Mammut, it ‘adapts perfectly to athletes’ typical movements in any situation’. As many alpine mountaineering routes begin before sunrise, the Gore-Tex Pro fabric used in this jacket features a Mammut High Visibility Backer, which makes the inside of the jacket look exceptionally bright, so that it is easier to find and put on in the dark of a tent or mountain hut. This feature also makes you easier to spot in an emergency. To suit the demands of winter mountaineers, you get a fairly standard set of features, including a helmet-compatible hood, removable snow skirt and pockets that are placed high on the body to avoid a climbing harness or rucksack hip belt. Pit zips are also provided, so that ventilation can be added when you cannot remove the jacket, such as while climbing. Get the jacket on and the fit is slightly neater and closer than others, but there’s enough room underneath for insulating layers. I like that the cuff adjustment and front zip are robust, chunky designs, so they are easy to use. 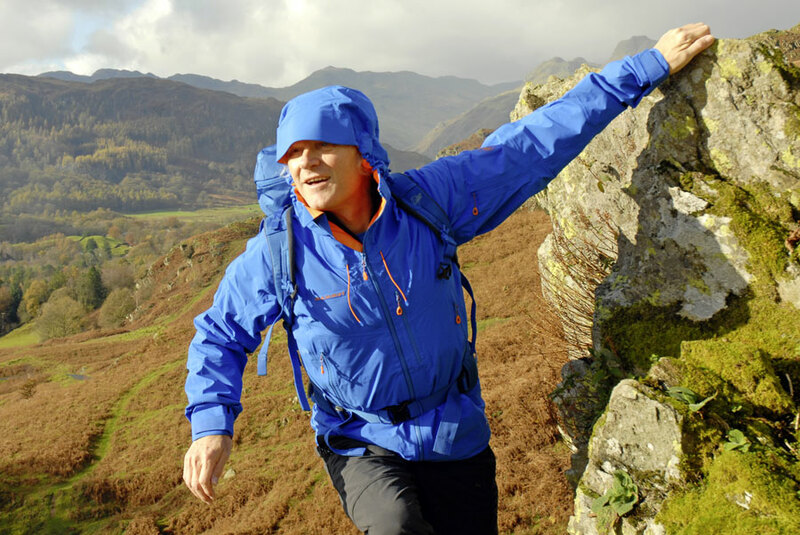 Most importantly, you can raise your arms without the cuffs or hem even thinking of moving, which is superb and something that makes a real difference to walkers and scramblers, as well as mountaineers. I also like that the two main pockets are large enough for maps and placed high on the body, so it is easy to store items in them or use them as hand warmers. There is a third, Napoleon-style, chest pocket, which is too small for OS maps or a Cicerone style guidebook, and this is a real pity, but it does take a GPS receiver or compass easily. The helmet-compatible hood has a mesh forehead panel for fit and comfort and this works well. The face and rear drawcords also worked well to adjust fit and the result was that this fitted closer and moved effortlessly with the head. Annoyingly, the peak is stiffened but not wired, so its shape is not quite as ideal as it could be – and if it does get bent, then it won’t be as easily reshaped as others. In use, this is a great jacket and certainly up there with the best for mountaineering. I’d like a larger chest pocket and a wired peak, but those are the only two features that niggle me, primarily because such features are available in other jackets that have a lower priced tag and a lower weight. But jackets that are a little lighter and that carry a smaller price tag don’t have the stretch version of Gore-Tex Pro and don’t have that bright lining and some don’t have the great sleeve movement or such a good hood either. So the real question here is does this jacket warrant the price tag of £650? A look back at the November 2017 issue of Trail gives a hint of what you could spend your cash on when looking for a waterproof jacket. There really are some great jackets around £300 to £400 that tip the scales at 366g to 619g and that use a version of Gore-Tex Pro. It comes down to whether or not you need those extra details on offer with the Mammut’s Nordwand Pro HS and how much cash you can afford to spend for what may be relatively small benefits. VERDICT Mammut’s Nordwand Pro HS offers some unique features. But although it is well designed for mountaineers, some details may not be perfect for every user’s needs. As such, at this weight and price it is a very considered purchase indeed.